So excited to share the wedding day of Kate and Tim... Kate and Tim wanted something a little different, something that was their own, and a true representation of themselves and their love. Tim and Kate chose Honey Horn Plantation as the venue for their Big Day. Honey Horn is a historical and beautiful little piece of Hilton Head that has expansive fields, old historic homes, and even backed up to a scenic marsh view. It was the perfect venue for these two, as it was a “blank slate” where they could chose and control every detail, and that is exactly what Kate, Tim, and Ashley from Ashley Rhodes Events did. Ashley did an incredible job taking Kate and Tim’s vision and making it a reality! When I asked Kate what was her inspiration for her wedding day, she said that is was antique hydrangeas. She loved how they are not fully just one color, but a mixture of light purples, pinks, greens, browns and whites. She loved how the nontraditional mixture came together perfectly in the flower. Tim and Kate also wanted the day to be outside and have the essence of the fall and nature. These natural elements along with the plantation, was the perfect dream wedding for Kate and Tim, and more importantly really represented the two of them! The two decided to hold their ceremony under one of the plantation’s giant oak trees. 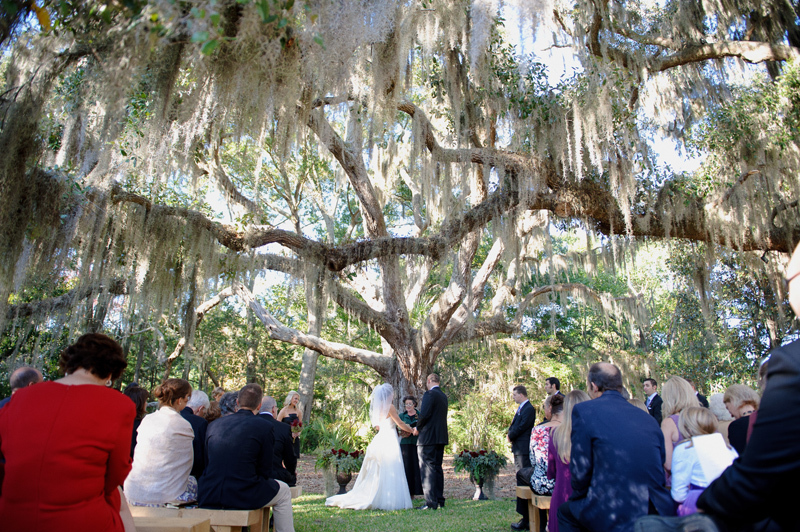 With the sweeping limbs and Spanish moss above them, Kate and Tim shared their vows complete with laughter, smiles and tears! After the ceremony concluded, guests enjoyed cocktails and hors d’ oeuvres on the back veranda as we captured some fun and sweet moments of Kate and Tim during the sunset on the marsh. Guests then made their way along a lantern and pumpkin lined path, to the pavilion. The pavilion looked rustic and enchanting, lit with twinkle lights and a variety of different shaped tables covered with burlap, candles, and purple, green and of course antique hydrangea flowers! After an amazing evening, the day concluded with a special toast made by Kate’s father. Kate’s father, for wedding favors made homemade limoncello! And as he said, just like Kate and Tim’s relationship, the limoncello is both sweet and strong!